We are taking bookings for 2018 adventures now. Sometimes you do the Dew…. Sometimes the Dew does you. Not sure which one this was, but this expedition/media production was a definite highlight for us here at OSV not to mention Scott Dickerson Stills and Motion and Surf Alaska. Scott served as captain of the M/V Milo, production support AND as talent for this production of Moniker Media and Mt. Dew. Unfortunately Captain Mike missed out on the first hand fun so he is more stoked than anyone to be able to share in this awesome video. 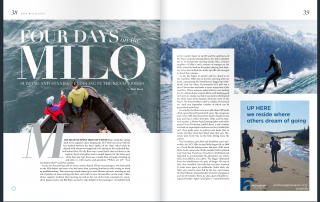 We were very pleased to have writer Matt Reed’s trip on the M/V Milo this ‘spring’ included in the May issue of ADN’s lifestyle Magazine 61º North. 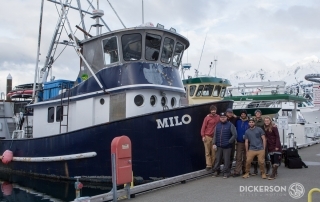 It’s a great article that shows how much fun even those new to ocean sports can have on the Milo. In addition to viewing the article in the magazine you can view a slideshow with additional photos (by our own Scott Dickerson of course) from the trip, here. We hope this gets you excited to plan your own trip – there is still time for you to join us this summer. Contact us today! Go west young man…the surf is good. Fall of 2014 marked our second trip stretching the boundaries of our westernmost expedition to include the farthest reaches of the Alaska Peninsula. This is an area we feel we have only begun to explore so we are heading back this fall. Interested? Let us know, we may have a couple spots to fill. Thanks to Scott Dickerson Photography for the photos. We consider the territory between Homer and Seward, Alaska to be our extended backyard. And there is no place better to spend the summer than out back. Here are a few shots from a trip through the Kenai Fjords this June. Thanks to Scott Dickerson Photography for the images. Bring Alaska Sessions home…two ways! 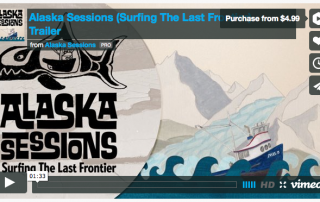 Thanks to overwhelming demand, Alaska Sessions is now (finally!) available online and DVD. You can rent or buy on Vimeo On Demand. If you like your movies the old-fashioned way, drop us a line and we can send one your way. 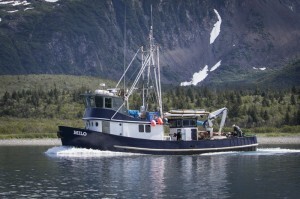 A lot of great things came out of the journey of the M/V Milo from Sitka, Alaska to her home port of Homer, Alaska. 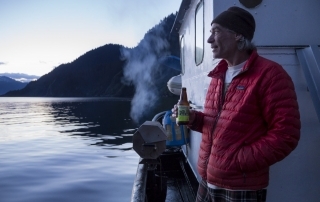 The label of Alaskan Brewing’s newest release, Icy Bay IPA is only the latest great thing. While Alaska Sessions filmmaker Frederick Dickerson didn’t get a lot of chances to surf on the journey, when he did he made the most of him. 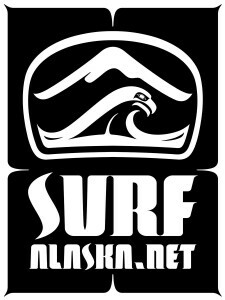 Scott Dickerson caught Fred on this wave and it has since become the label for Alaskan Brewing’s newest beer. We just wanted to make a quick announcement about our newest family member here at OSV, born October 14, 2013. 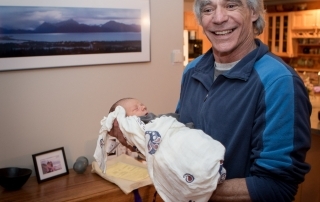 Here is Riley Glen Dickerson, just a few days old, and his ‘Uncle’ Captain Mike McCune. Everybody loves this little guy and we’re looking forward to the day he gets his first wetsuit. Here at OSV we always bask in our brushes with fame, however big or small. So right now we are loving the fact that two of our very own are featured in the Red Bull Illume, an exhibition that will travel the world for two years, lighting up the night with 50 images displayed on 2m x 2m lightboxes. 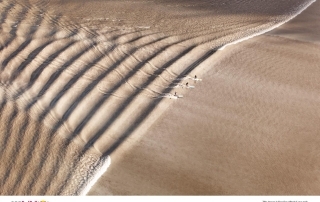 Here OSV’s Scott Dickerson captured this amazing image of Captain Mike on the Turnagain Arm Bore Tide (along with Dave Calkins and Eric Newberry). This shot brought together many of Scott’s passions; the only thing missing is the M/V Milo. Check out this fun story from Christian Beamish, who accompanied the Malloy brothers, Chris and Keith, as well as some other excellent surfers, on a recent mission into the gulf. 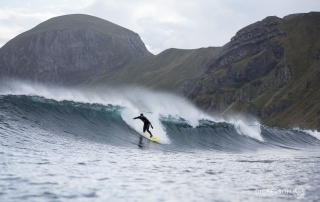 Photos by Chris Burkard (stay tuned for some video to come from Scott). This was one of our best trips to date- everything came together with little effort and while we didn’t score huge waves we had some excellent surf and equally excellent fishing and eating. Not to mention excellent weather. And company! 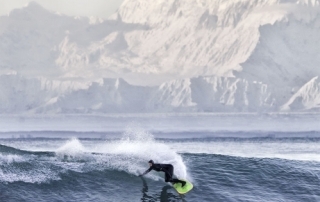 It’s happening…Alaska Sessions at the San Diego Surf Film Festival now! Captain McCune and some of his crew are hanging in sunny SoCal getting ready to enjoy Alaska Session’s showing at the San Diego Surf Film Festival. That and making the most of the festivities and getting some waves! Alaska Sessions will keep working the film festival circuit this year and we’ll keep you posted when it’s available on dvd/download. Thanks Mike, Stephanie, and Scott so much for an unforgettable trip. It’s been such a blast hanging and surfing with you guys. I’ve learned a ton and hope to make it back up here someday soon. If you are ever down Santa Barbara way, give me a ring! Had an awesome adventure with the Milo Skiing the Augustine Volcano from its smoking caldera and exploring a couloer-to-the-sea in Iniskin Bay…8 skiers lots of laughs, incredible country, and ski inspiration for a lifetime!!! Thanks a ton! Adventure is what you make it…Thanks to the Milo crew for crushing it! Love the surf platform—until next time! AK on water! It’s a first for me, but definately not the last! Thanks so much, Mike, Scott, Wendy, and the “Milo” for such an insane four days. It truly was awakening. All the way from LA I came, not knowing what to expect. What I got was great food, scenery, waves, and even better company. I can’t wait to return, my stay was too short, but next time I’m bringing my wife, Jamie. All the best, thanks for everything! Way to push it in the last Frontier! Incredible spirit and people on the Milo…many thanks and look forward to getting back aboard. Mike, Wendy, Dickerson…you da best!!! What a trip, trip of a lifetime! The Milo is ready for anything, the Humbug knows how to ride waves, and the crew’s the s*%”t! Thanks for everything, never had such a good surf seshion–AK love. Way to start us off right!